Home / Sins and Punishments / MOBILE PHONE MESSAGES THAT SPREAD FORTUNE TELLING. 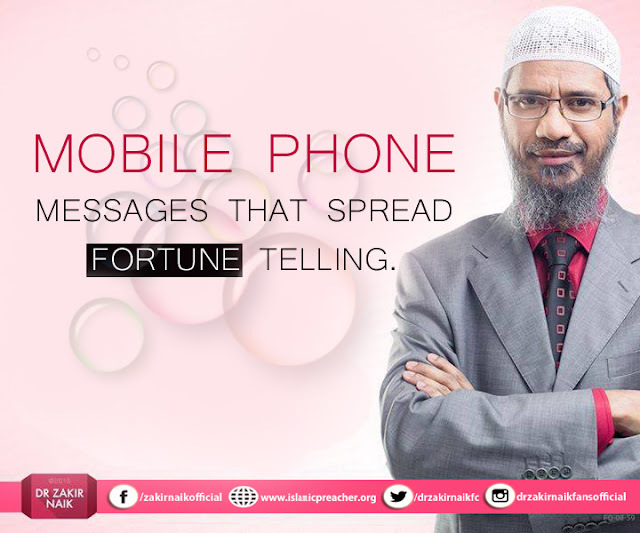 MOBILE PHONE MESSAGES THAT SPREAD FORTUNE TELLING. Humans have no way of knowing future and are not to make any guesses as the knowledge of unseen is one of the things that Allah has kept for Himself and not for anyone else. Not even prophet Muhammad peace be upon him, nor even angels. There are a number of verses and hadeeths which speak of that. Nowadays it is normal to receive SMS or WhatsApp messages that say, choose among the following numbers/letters/symbols and we will tell you what your future will be like or we will tell you about your spouses etc. Sometimes we even receive messages that say send this text to over a certain number of people and receive a good news in 5 or 10 days. People assume it to be a game and entertainment and not a form of fortune telling, but when we forward such messages we are actually taking part in fortune telling and believe that something good will happen if we follow it. We say with our tongues that it is nothing and only a game but hearts are hoping for something else. Do you think Allah is unaware? People indulge in these activities out of curiosity and participate ignorantly. It must be noted that all this comes under the heading of fortune telling and speculation about what might happen. It is a falsehood. It is a major sin and can lead to doom. 3 – When he goes to a fortuneteller and asks him questions so that he can explain to the people what he is really doing, which is deceiving people and leading them astray. There is nothing wrong with this. The evidence for that is the fact that the Prophet (peace and blessings of Allah (swt) be upon him) went to Ibn Sayyaad. The Prophet (peace and blessings of Allah (swt) be upon him) thought of something to himself. The Prophet (peace and blessings of Allah (swt) be upon him) asked him what he was thinking of and he said, “Al-dukh” meaning al-dukhaan (smoke). End quote. We may conclude that such messages being a kind of game is not correct because unknowingly we believe in falsehood. It is a kind of fortunetelling, lying and charlatanry. Moreover, it does not matter of games and entertainment, rather it is a matter of religion. It is an issue of belief and faith. We must not foolishly accept to play something that is not fit in our religion. These are the things that are intended to make a mockery of the signs of Allah. repentance includes to advise your fellow brothers in Islam about its evil and danger it poses to their faith and hereafter. We ask Allah to protect us from the evil of fitnah, both hidden and apparent.